If you’re ever looking for a way to cheer me up, just give me some cookie dough. I’m telling you, it works like magic. Especially these delicious bites. 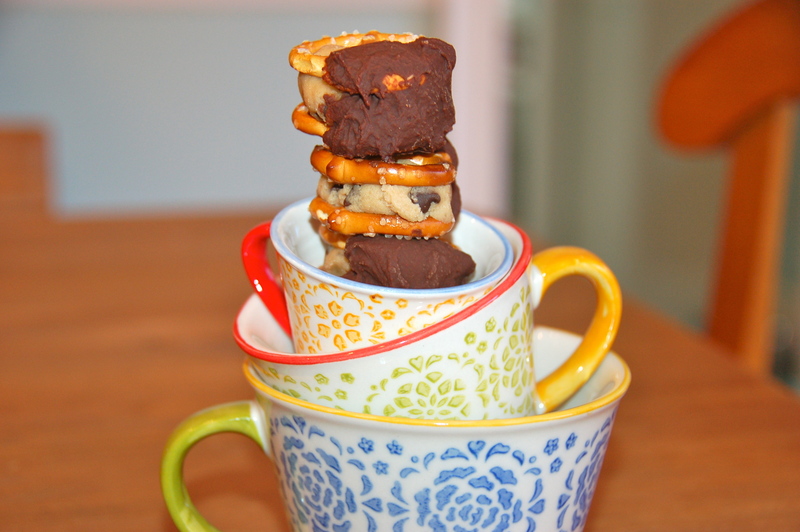 They’re quick and easy to make, with egg-free cookie dough smushed between two crunchy, salty pretzels, and dipped in a layer of melted chocolate. It doesn’t get better than that! I made these a while ago for the cast of Shrek on one of our two-show days, and they were gone before our stage manager called to tell us a half an hour before showtime! They’re perfect if you’re making something that needs to travel, has to serve a large number of people, or is being made for kids, because they’re relatively compact and mess-free. Overall, they only take about a half an hour to make, including chilling the dough, and are no-bake! And if you aren’t in the mood for chocolate on top of chocolate chips (for some crazy reason), or are pressed for time, you can easily skip dipping the bites in melted chocolate and serve them as is. With or without a chocolate coating, these bites are the perfect combination of sweet and salty, and are just the right size for a quick snack. Enjoy the recipe and comment below how they go for you! In a stand mixer with a paddle attachment, combine butter, brown sugar, and granulated sugar on medium speed until light in color and texture. Add milk and vanilla and beat on low speed until incorporated. Add flour and salt, with the mixer off, and then begin beating on low speed, and then on medium speed until the dry ingredients are combined. This can take a little while, but just keep mixing until everything comes together – it will, I promise! Roll the dough into balls, making sure each ball has about two teaspoons of dough. squeeze the dough between two pretzels, like a sandwich, and place them on the baking sheet. While they’re freezing, place the chocolate chips in a bowl over a pot of boiling water, creating a double boiler, and stir in the shortening until it becomes a smooth, chocolate mixture. Take the bites out of the fridge and dip them each halfway into the melted chocolate. Once they’re dipped, place them on the baking sheet again, refrigerate for 15 minutes, and serve! They’ll stay delicious for up to 5 days.